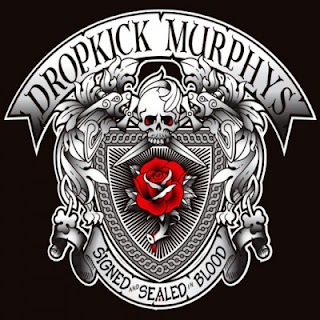 “The Boys Are Back” was the first song of the Dropkick Murphys new album “Signed and Sealed in Blood” I heard. I thought it was fair then, not more. I thought it was a bit too Jolly and sentimental in a comic book manner. But the song grow with time and today I really like it. Then it was Christmas time. “The Season Upon Us” is a more sentimental Christmas type of song in the tradition of the Pogues classic “Fairytale of New York”, possible the best Christmas song ever made after silent night. Anyone that steps into that territory are out on deep water, first I was skeptical, then it was clear to me if someone going to do it, it was going to be the DKM. Actually I think they did it quite beautiful. Now that was the eventually hesitation of this records are done. On to the Gold. Tunes as ”Burn” and ”Rose Tattoo” I can probably already dub as classic DKM tunes. Backed up by the rest set of songs, especially “My Hero”, “Out of the Town” and “Out of our heads”. There are no dull or OK tunes on this 12 track album, which makes this a right through good record, possible at the end of the year might end up as one of the pearls of this year. This years perfect CD for your car either your are cruising in the sunshine looking for chicks or going to work. Definitely one of the best Dropkick Murphys records ever made in competition with “Sing Loud…” and “Do or Die”. Worth buying? HELL YES, buy one for you old man, mother in law and best friend as well.